If you are looking for a convertible car seat that has incredible safety features, can be used rear and front facing, and is small enough to use in compact cars, this is the car seat for you. The Britax Convertible Car Seat model Boulevard ClickTight is a great product that you (and your child) are sure to love. Their patented technology makes installation a breeze, and gives you peace of mind that your child is completely safe. First off, the seat is used as a rear facing seat when your child weighs between 5 and 40 pounds, and is no taller than 49 inches. The NHTSA recommends children stay rear facing as long as possible, or at least until they are 2 or 3 years old. For the average child, they will remain within this height and weight range until they are at least 3 years old, making this a great car seat that allows you to keep your child rear facing for as long as possible. Once they outgrow the rear facing limits, the seat is used front facing, and can be used when your child weighs between 20 and 65 pounds, and is no taller than 49 inches. Notice that the height requirement is not increased, so if your child grows taller than 49 inches, you cannot use this seat, even front facing. The weight maximum is 65 pounds, which is really good for a car seat. 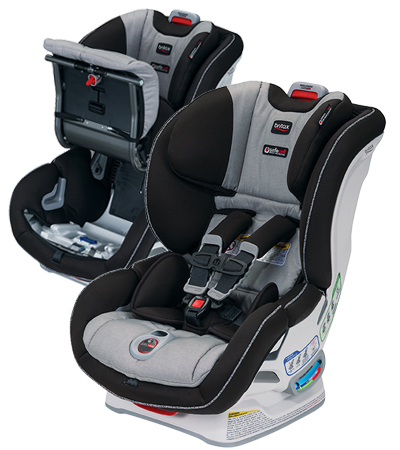 Your child should definitely be able to use this Britax convertible car seat for several years. This seat comes with plenty of adjustable elements in order to ensure your child is always positioned properly and is comfortable. In particular, there is a 14-position adjustable harness and 7-position recline on this model. As your child grows, you can be sure their harness is still fitting securely and in the proper position, and that the seat is positioned properly in your car and so that your child is comfortable. Additionally, no rethreading is required to change the position of the seat or harness, making it easier than ever to adjust this model. This Britax convertible car seat was designed with your child’s safety in mind, and is the only brand that employs SafeCell Impact Protection. This protection combines various elements that all work to keep your child safe, including an energy absorbing base, steel frame, V-shaped tether that keeps the seat from rotating, and staged-release switches which help slow the seat’s forward movement during a crash. This seat also features not 1 but 2 layers of side impact protection and impact-absorbing harness pads that reduce your child’s forward movement in the event of a car accident. All together, this is one of the safest car seats you can buy that has some of the most safety features we have seen. Right there in the name of this product gives another reason why this car seat is so awesome. 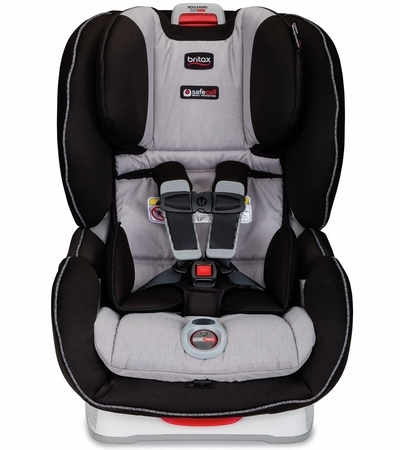 This Britax convertible car seat has ClickTight technology that makes installation easier than ever. Not only is this installation system easy, it also guarantees a secure installation every time. All you do to install this seat is open up the front of the seat, buckle your seat belt in place, and close the seat and lock it into position- that’s it! This model also features a level indicator that shows you if the seat is positioned properly. You can also make sure the harness is tight enough by listening for a click that sounds when the harness is properly positioned. Parents love this car seat, giving it a high average rating on Amazon. Parents love all of the safety features and adjustable elements that make this seat work with any child. The seat cushion itself is made of a very soft material that children love and find very comfortable. The most commented on feature, however, is the the ClickTight system – parents love how easy it is! Even though this seat is heavy, it is easy to install thanks to the ClickTight installation. If safety is your biggest concern, this is the seat for you. This Britax convertible car seat has so many safety features that you can rest assured your child will be safe on the road. If you are on more of a tight budget this car seat may be a bit of a stretch for you, but keep in mind you will be able to use this seat for several years, and both rear and front facing. Once your child outgrows this model they will likely only need one more seat (a booster seat of some type) until they are ready to use a regular seat belt. 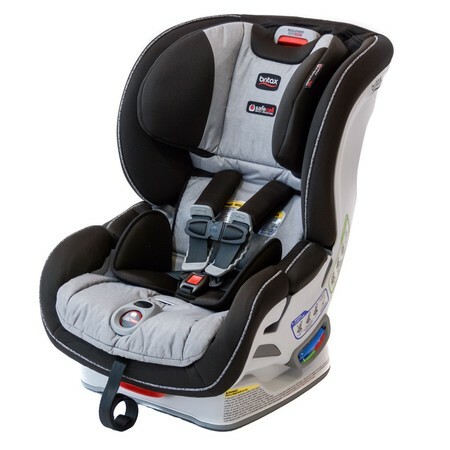 For all of the safety features and easy install technology, we think this car seat is well worth the money and is a great investment in your child’s safety.